20-year-old Argentine Juan Martin del Potro outlasted 15-time major champion, 28-year-old Roger Federer 3-6, 7-6 (5), 4-6, 7-6 (4), 6-2 in a 4 hour, 6 minute marathon to win his first major title and prevent the Swiss great from winning his 6th consecutive US Open title. 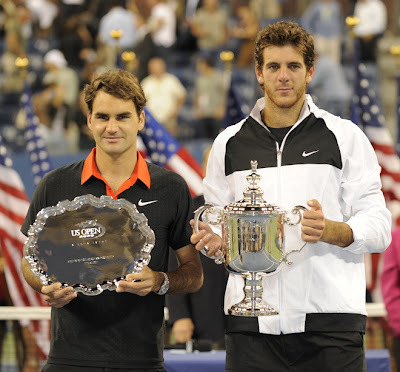 Del Potro became the first person to win a major by beating Federer and Nadal at a major tournament. 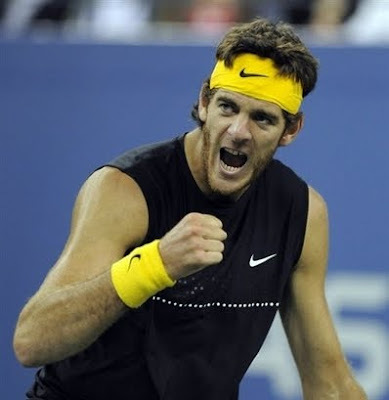 In the semifinals, del Potro handed the Spaniard his worst loss in a major, allowing Nadal a mere 6 games in 3 sets. The Argentine also became the first person in Federer's 21 grand slam major finals to beat Federer other than Nadal (who has done it 5 times out of 7). Federer was definitely not playing his best tennis, not serving particularly well, finishing with only 13 aces and 11 double faults over 5 sets, a far cry from the 50 aces Federer served in his thrilling 5-set Wimbledon win over Andy Roddick earlier in the summer. Federer finished with 56 winners to 62 errors (-6) compared to del Potro's 57 winners to 60 errors (-3). 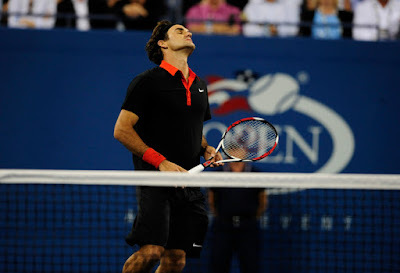 Federer was attempting to extend a 40-match winning streak in New York, his last loss coming to another Argentine, David Nalbandian, in 2003. However, despite being ahead in both the second and fourth set, Federer managed to lose them both in tiebreaks and eventually lost the match and his title to the 6'6" 182 pound youngster from Tandil, Argentina.